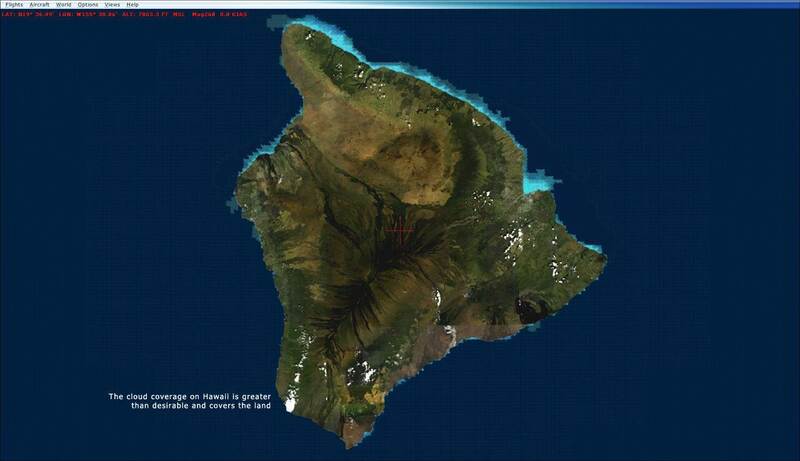 We were hoping to bring you a spectacular MegaSceneryEarth 2.0 - Hawaii product however due to a problem with more than desirable cloud coverage in some areas from the original imagery we were able to source there are some areas that do have about 3 to 5% cloud coverage. 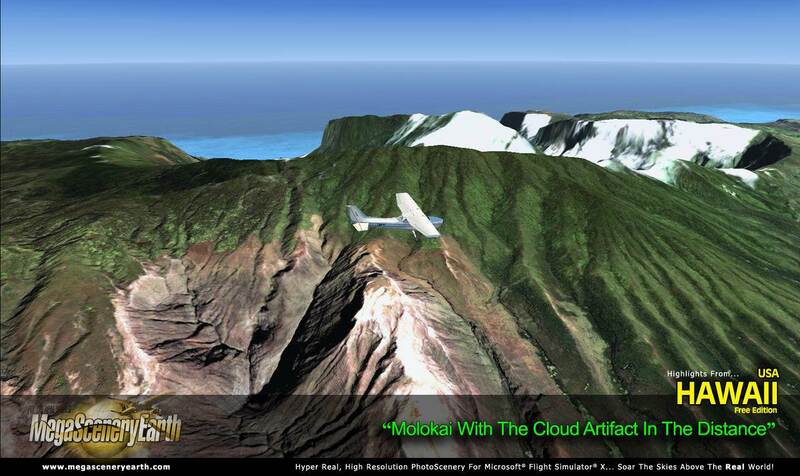 The artifact is present on the islands: Hawaii, Maui and Molokai. It is not that drastic but significant enough for us to decide to not release it as a commercial full price product. 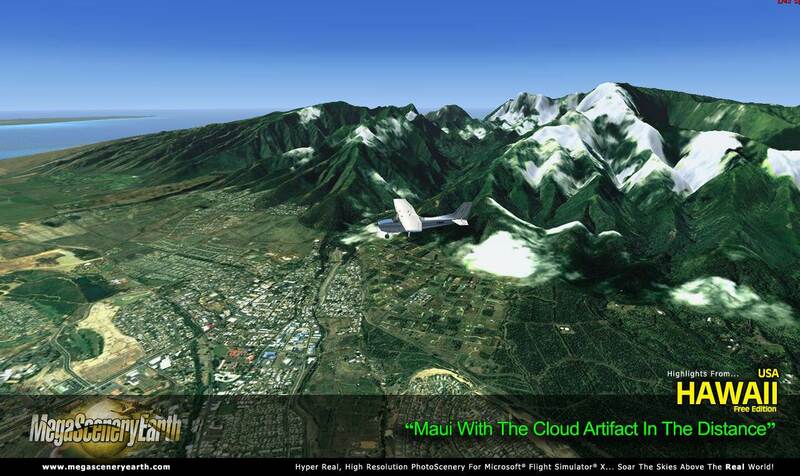 However, we know you all want to fly the entire Hawaiian Island chain so we are making it available to you at a price that will cover the bandwidth and server costs and other fixed costs to deliver it to you. That price is just $5.00. 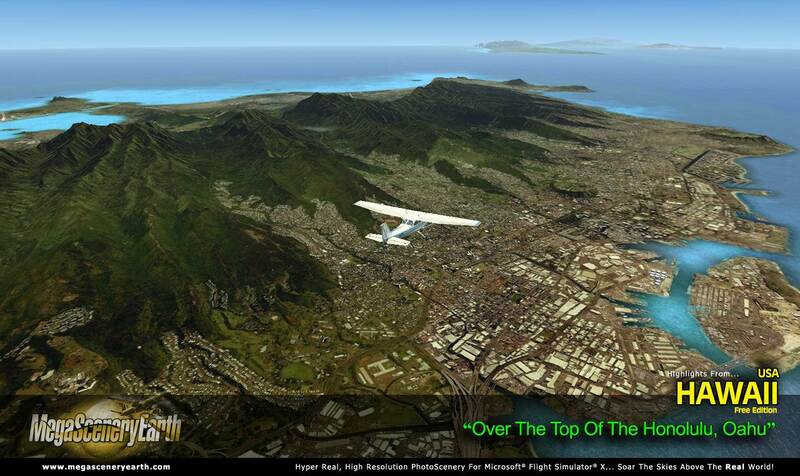 This way you can get to enjoy flying the Hawaiian Islands. 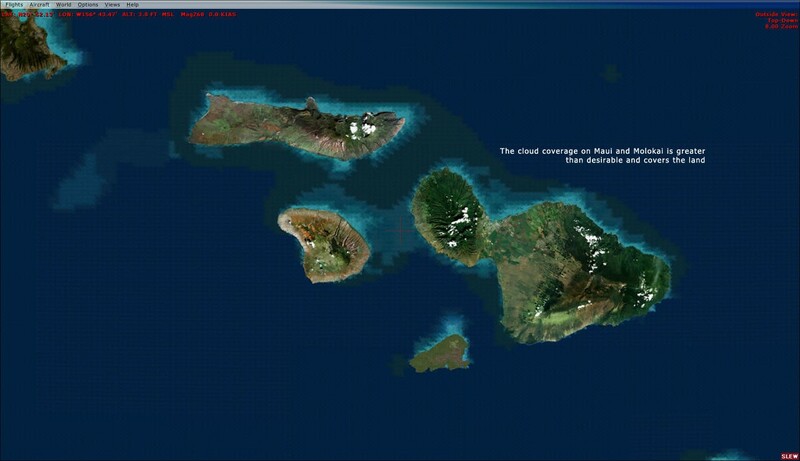 Incidentally, the areas and islands that don't have this cloud coverage are truly spectacular and worth a lot more than the $5. So the product itself is free but we are just asking you to pay the $5 to cover the bandwidth and server costs for the 8 Gb download. When we are able to source a 100% cloud free Hawaii imagery we will re-release as a regular full price product and we'll also give you a rebate on the $5 you paid for this not-quite-to-commercial-standards edition. We hope you find this to be a suitable solution that will give you the product you want and at the same time keep the release schedule for MegaSceneryEarth 2.0 areas flowing. 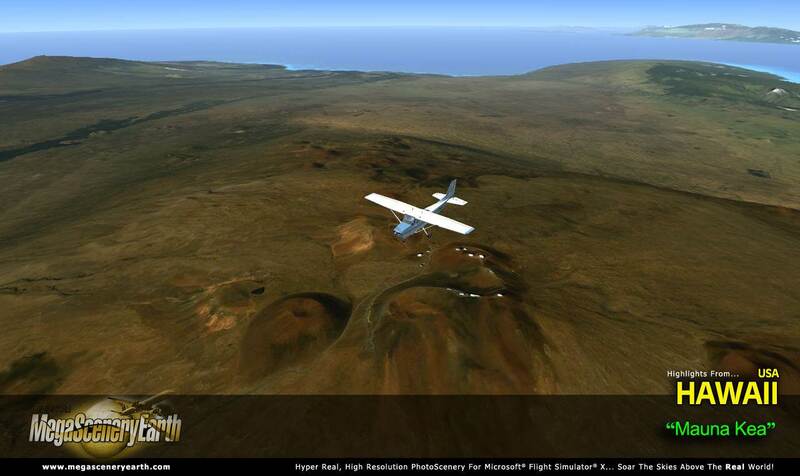 The screenshots below will illustrate the issue with the cloud coverage but you'll also see just how good the scenery is for the areas not hindered by the cloud coverage. The rest of this page will give you a description of what you are getting with this scenery using our standard product descriptions. 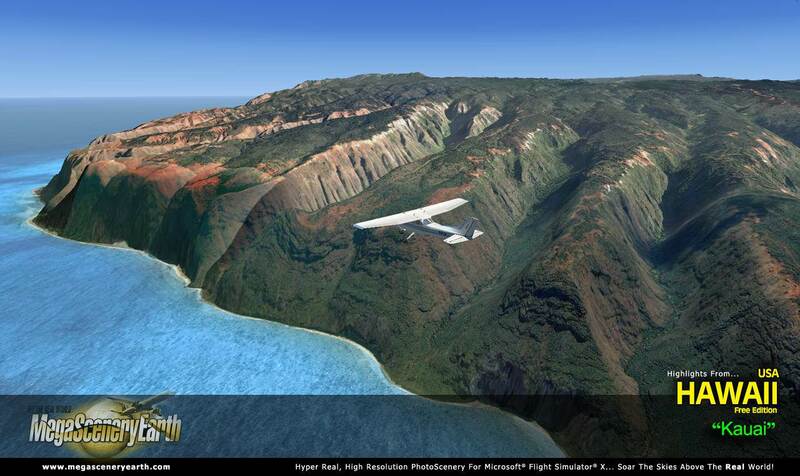 Hawaii is over 6,423 square miles and has 41 airports. It consists of 8 islands. 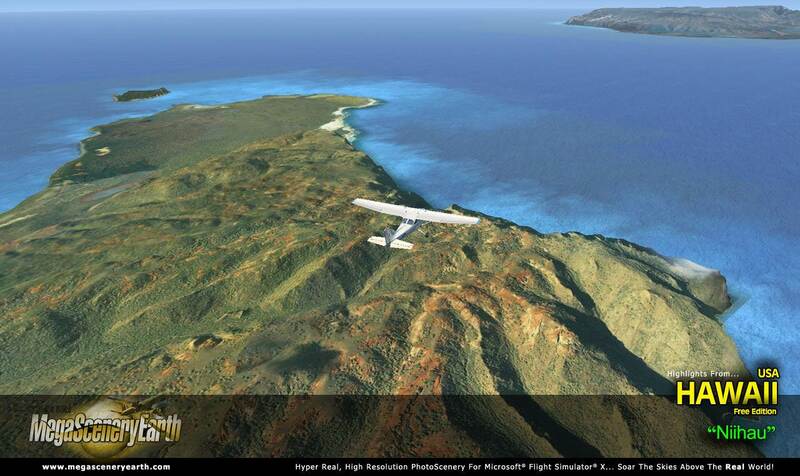 The scenery comes with all the VFR and IFR charts needed to get the most out of your scenery including 1 Sectional, 1 IFR enroute charts, a 125 page book of Instrument Approach plates, Airport Diagrams, SIDs and STARs, and an Airport Facility Directory. The charts are downloadable along with your scenery files. Lakes & Water Bodies: Salt Lake, Pacific Ocean all around! Mountains & Hills: Mauna Kea (13,606 ft), Pu'uwekiu, Manua Loa, 1940 Cone, 1949 Cone and a total of 50 other peaks and mountains above 8,800 feet. State Parks & National Forests: There's a total of 50 state parks. 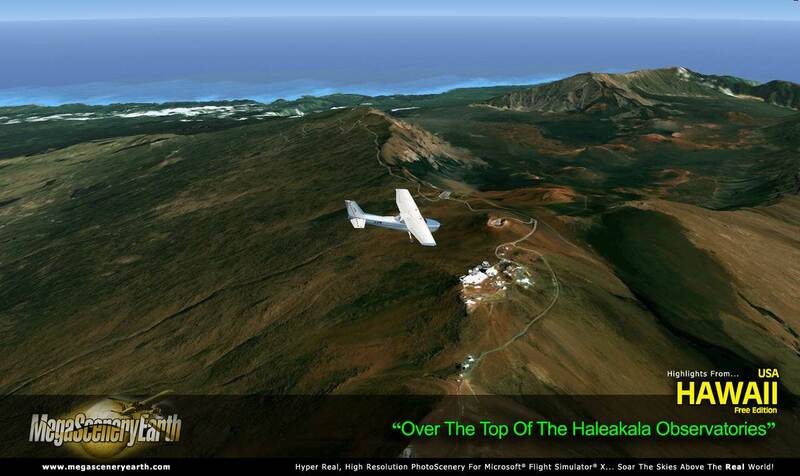 THIS TITLE COMES WITH A FULL SET OF FAA AERONAUTICAL CHARTS FOR Hawaii IN PDF FORMAT. If you don't like to download, choose the DVD MASTER Option and we'll master a 2 disc DVD set with the software and mail it to you anywhere in the world for $5.00 - all inclusive. Please note that this is a large download at 7.6 Gb. If you are unsure of the stability of your connection we highly recommend you order the DVD Master Option and you'll receive this area on 2 DVDs. NOTE: You will download a small zip file that has a html file with links to the 9 files that you will download. NOTE: You will download a small zip file that has a html file with links to the 8 files that you will download. If you're not confident with the large download you can order the DVD Master for $5. (2 DVDs).